Staff enjoyed a coffee morning for St. Patrick’s Day today, organised by Katie Anne Hunter as part of her fundraising for going to Tanzania for 6 weeks with the Lasallian Developing World Projects. Heather Baird is also going but to India instead. Tutor class, 1A1, held a Halloween coffee morning for their practical abilities PSHE project. The class made cakes, and invited members of the SMT, Guidance, Janitors and House Captains to the event. The Personal Development class would like to thank everyone for attending their coffee morning at which they raised £117. Some of the money has been donated to the charity “Little Princess Trust” – this is a charity who make real hair wigs for young people going through chemotherapy – for which Megan Burns is going to donate her own hair. The rest of their money will be used as working capital for their enterprise activity. A special thanks also to everyone who donated raffle prizes and to Mrs Evans for donating her lovely home baking! On Tuesday 9th September the 5th and 6th year Personal Development class held a coffee morning to the staff of Our Lady’s High School to raise money for the Little Princess Trust that makes wigs for girls that can’t grow their own hair. We also raised money for our Enterprise projects. We not only just held a coffee morning, we baked the cakes, advertised, made and sold tickets so every member of staff knew we were having one. First of all, we had to decide the date, what food to make, visit Mrs Sinclair to ask if it was ok to have one. Then we had to make and sell tickets to the staff, order the stock, ask for raffle prizes, make the food and then finally hold the coffee morning. I think the whole thing was a success even though there was a few bowls smashed and arguments we still managed to pull it off in the end. The only thing I wished we done better was talked more on the actual day because everyone was running around hectic and there was a few arguments because someone was where they shouldn’t have been. But after all the hard work we pulled through in the end. XL4 organised a coffee morning for Macmillan Cancer Support. Staff enjoyed refreshments and cakes and the pupils raised £102. Thanks to all staff for their support. The senior school Scottish Studies class celebrated Burns Day by holding a coffee morning for staff. 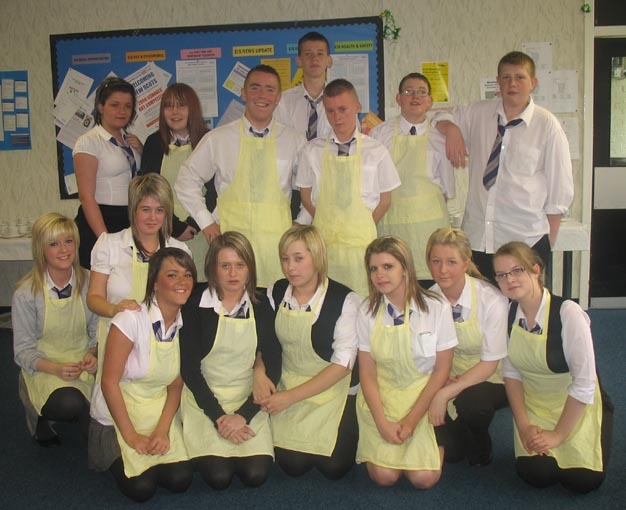 Home made baking was donated by both class members and staff, including traditional Scottish items such as shortbread. Members of staff were treated to the poems and songs of Burns while enjoying their tea, coffee and cakes. The class were raising funds for their forthcoming excursion which will support the completion of their Scotland in Focus unit. The Enterprise and Employability class held a coffee morning on the 21st January as part of their Enterprise course. The coffee morning was in aid of a charity called SANDS. SANDS is a charity which supports families who have a stillborn child. The pupils and staff raised £85.32 in support of SANDS. It was a good turnout, well represented and grateful appreciation in support of this SAND charity. SANDS stands for Stillbirth and Neonatal Death Society. Andrew House pupils organised a coffee morning with pipers and entertainment to celebrate St Andrew’s Day today. Andrew House also sold tartan ribbons and badges with all proceeds to St Andrew’s Hospice. Our favourite pipers, Mr Jim Hughes and Michael Clark (S4) played to entertain the staff, who happily munched away on oatcakes, shortbread, fruit cake, mince pies and saltire empire biscuits, made by the very lovely Mrs Evans. 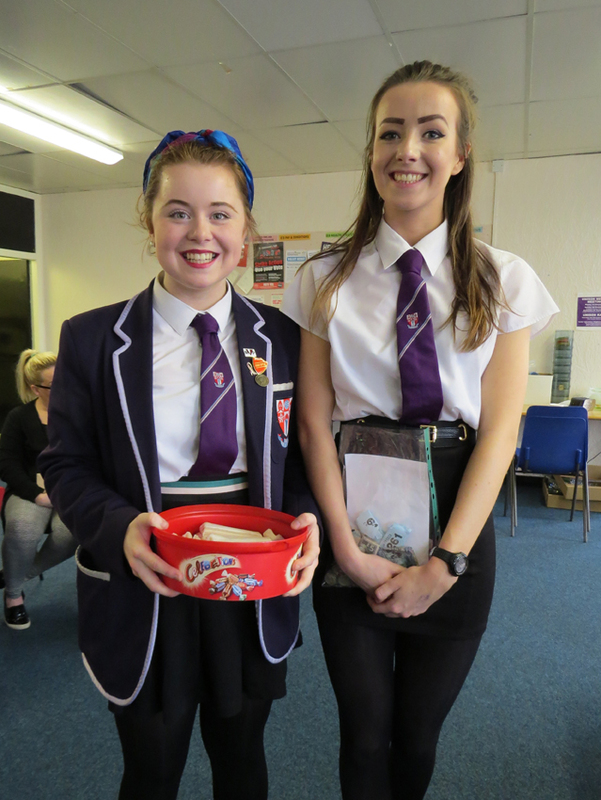 Thanks also to Tunnocks who donated teacakes and caramel wafers for the event. Our 3rd year XL group organised a coffee morning on 27th September in aid of the Macmillan Cancer Trust. The group wanted to do a project to help others and applied for a pack to Macmillan Cancer Trust. They organised and budgeted everything themselves, as well as making tickets and posters, and collecting raffle prizes. Mrs Sinclair allowed an extended break, the pupils were on excellent form and really enjoyed it, raising £120.87 in the process. This was their first event together which was a real success and the pupils are now trying to look for another charity to help. 5th year pupils in the Personal Development class arranged a coffee morning for staff which was held this morning in the Common Room. The pupils organised the whole event themselves: designing, making and selling the tickets; making the room ready; serving the tea and coffee; and documenting the occasion as evidence for their course. Our Lady’s celebrated St Andrew’s Day with a coffee morning. Staff got stuck in to shortbread, scones and saltire adorned Empire biscuits, not forgetting the specialisms of well known Uddingston chocolatiers, Tunnocks. Leftover goodies were sold around the classrooms. Staff were piped in to the event by piper, Mr Jim Hughes, who just happens to be Mrs Connor’s father. A crowd of pupils also gathered to watch Mr Hughes’ piping, and were later heard attempting to sing “Loch Lomond” while marching down the corridors. Andrew House pupils had already been hard at work creating saltire and thistle badges which were sold across the school over the past fortnight. The entire House group also celebrated mass together with Father Miller in the school theatre this morning. Many thanks to everyone who volunteered their time, especially Mrs Evans, Mr Hughes, Father Miller and of course, Andrew House Principal Teachers, Mrs Connor and Mrs McGuigan. All of the day’s events have been aimed at raising funds for St Andrew’s Hospice. The latest total is £300. A coffee morning was held last week to help raise funds for the 6th year staff and pupils who are intending to visit Rome in February. With an Italian theme (and Italian coffee, biscuits and ham) the event was a huge success and very well attended by staff. More events are planned between now and Christmas, including a quiz and various busking sessions in Glasgow. The quiz night is being held at St Bride’s Hall on Friday 16th November and tickets are available for £10 per four person team. A raffle will also be drawn on the night and tickets are already available at £1 each strip. Keeping with the Italian theme, the star prize is a hamper of Italian goodies, but there are numerous other prizes. If you would like to support these events, please contact the school on 01698 265191.